If you have followed my blog or social media for any period of time, you know that I love to have little photo shoots with my kids. It is something that I love to do for a couple of reasons. I like to have the photos as memories, I think my kids are so cute so I love to look at pictures of them (haha) and I have that mom guilt that time passes so quickly so I need to capture every.single.moment! Since Adalyn is starting school, of course we will be having a first day of school photo shoot just like most parents on the planet. I have three years of experience of taking pictures of kids and I wanted to share some of my kid photo shoot tips. Preparing for a photo shoot is the number one most important thing about it to me. If I forget my SD card in my computer, my daughter's sparkly shoes that she must wear or the camera battery, I find myself scrambling and the kids losing steam. To get them at their best, be prepared ahead of time. Lay out all of their clothes and accessories the night before for a photo shoot and get your camera gear ready. To make a photo shoot successful, I have had to think of ways to get my strong-willed toddler ready for the shoot. Sometimes, she is like "mom, I'm not doing this" so what helps a ton is to get her excited about it. Before her nap, I will say "Adalyn, when you get up, I need your help on a really important project" and then she gets all excited and wants to help me out. This works for first day of school pictures too! Just say to your child that you are going to take a picture of them because it is such an important and exciting day and they look so awesome to up their excitement. When you are taking photos, capture their little personality with some up close shots. I love taking pictures of my daughter’s face up close and capturing the crazy faces she makes. I love taking pictures along my back fence in my yard or in my front yard. Whatever looks the best and where the lighting is the best is where I usually shoot if I am taking pictures at home. Sometimes, this includes preparing the area ahead of time. The grass may need to be cut, a porch may need to be cleared off or windows in the background of your photos may need to be cleaned. When it comes to cleaning my windows, I like to stick with the best: Windex® Original Glass Cleaner which I purchased at Kroger. We often take pictures on our front porch and make sure that the glass storm door windows are clean because dirty windows and doors will show in photos. Once you get your beautiful photos printed, you can use Windex® Original Glass Cleaner to keep your frames clean. I use the Windex® Original Glass Cleaner for windows. For cleaning other surfaces, I like the Windex® Vinegar Multi-Surface Cleaner. It is ammonia-free and does not have a strong vinegar smell but a fresh, clean smell. It can be used as a bathroom or kitchen cleaner, on tile, ceramic, plastic, on stainless steel and more. We recently got back from a trip and I got the cleaning bug! I seriously cleaned the entire house with this and my husband said everything looked awesome and he liked the smell. Follow Windex® on Facebook and Twitter. I am so not crafty but I love seeing those gorgeous chalk signs that parents make that say that it is the first day of a certain grade. If you are like me, you can just PicMonkey or another site to add in an overlay with which grade they are in, the date, etc. My favorite light to shoot in by far is natural light. Photos taken inside when it is dark just do not turn out the same. If possible, take photos outside in natural light. You will be happy you did! Sometimes, photo shoots go not exactly how you want them to lol! Many parents may not have to use this one but if your kids really do not want to cooperate, you can bribe them with a little treat. Normally, this may not be the best tip but desperate times call for desperate measures! It doesn't have to be candy or anything junky but for Adalyn, sometimes just the promise of having her favorite fruit or a sticker works wonders to get the beautiful smile that I want. She is a stubborn little one and sometimes wants to give me a big frown even though she is happy. I edit my photos with the free photo editor on my computer and just usually brighten them a bit and add some contrast as needed. I wait to get my photos printed about 2-3 times a year when I have my photos all edited and find a good print deal. There are plenty of deals so just wait until you find one where you can get photos developed for a low price. 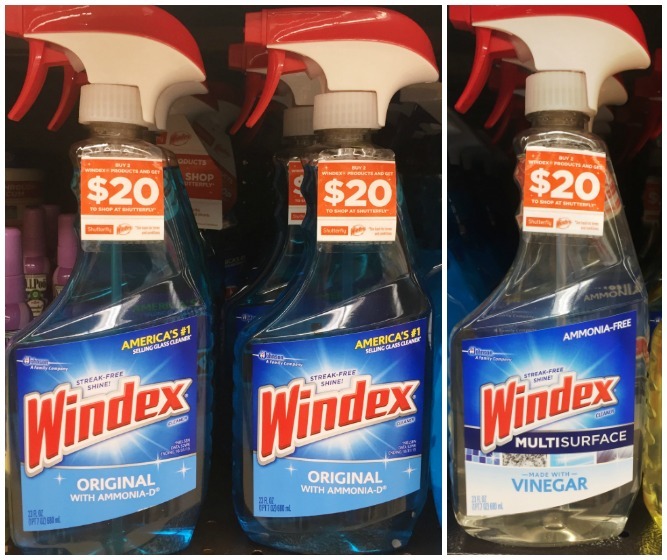 Windex® has paired up with Shutterfly® for a great deal! When you buy 2 Windex® products, you will get $20 to shop at Shutterfly® (offer valid 7/15/17 – 12/1/17. Visit here for terms and conditions). Good luck to all of you on the first day of school with your kiddos! I can't wait to see first day of school pictures all over social media. Your pictures do come out excellent, and you have a good gift to capture a special moment, I wonder how many are bribed!!! LOL. I got some good tips here, and your kids are soo adorable!